Ahhh, the smell of Fall is in the air. With it, there is excitement. For Foodies, it’s the beginning of Comfort Food Season. Heartier fare and bigger, bolder beers and wines. For me, September and October hold the promise of my favorite celebration of all. Break out your Trachten shirts, lederhosen and dirndls people. It’s Oktoberfest!!!! This year, as always, I am headed beyond the Cheddar Curtain to the Promised Land —Wisconsin. Home to a 42% Germanic populace and to the most authentic Oktoberfest celebrations in the U.S. this side of Munich. The Bavarian Bierhaus, which opened earlier this year, will host the oldest and one of the most authentic Bavarian Oktoberfest celebrations in the Midwest. Modeled after the one that takes place in Munich, Germany, it takes place every September on the four weekends following Labor Day. Admission is $5 at the door or $4 in advance (available at the restaurant). Kids 12 and under are free and firefighters, police, active duty military and veterans get in for free on Fridays. The festivities include traditional German brass bands, Schuhplatter folk dancing, singing, yodeling, sing-alongs, dancing, food and drink. Wearing the traditional lederhosen and dirndls at this festival is as normal as someone putting on jeans and a T-shirt to go to a regular bar. Meanwhile, you can try your hand at various smaller carnival-like games or enjoy a large Bavarian pretzel or bag of hot, roasted candied nuts. It is truly an epic experience. To round up your month of Gemütlichkeit, you may also want to try downtown Milwaukee’s Oktoberfest celebration. Situated in the beautiful Pere Marquette Park across from the Hofbrau-franchised Old German Beer Hall (one of the sponsors), this equally exuberant festival is initiated by none other than the Mayor of Milwaukee tapping the first wooden keg to get things rolling. This harkens back to the same tradition in Germany of the Mayor of Munich tapping the first keg. At any festival in Wisconsin patrons are even encouraged to bring their own Maßkrug steins to be filled with the glorious beers produced by Hofbräu. Later, if one is so inclined, you can try your hand at Maßkrugstemmen (beer stein holding). See how long you can hold a 1-liter glass stein full of beer (about 6 pounds) straight in front of you. At any point, you can retreat from the tent’s festivities by walking around the gorgeous park scenery right on the river. I am taking my father for his first experience this year. I can’t wait until he tries his first cold sip out of a Maß in his new Trachten shirt! Get out of your normal comfort zone and head to Wisconsin this month. You won’t regret the experience! The traditional German Oktoberfest season is upon us! We're highlighting some of the excellent celebrations taking place right in the suburbs of Chicago, perfect for a quick getaway from the city or a destination for family activities. Highlighted festivals feature local craft beer. Celebrate in a big heated tent full of good food, beer, live music, and family-friendly festival activities. Put on by the Rotary Club of Palatine. Friday 5-12pm, Saturday 12-12am, Sunday 12-6pm. More info. The German American Central Society & Peoria Park District. Featuring German Heritage tent, puppet theatre, live music, German vendors, family activities and rides. Featuring Spaten Oktoberfest, German wines and spirits. Friday 5-11:30pm, Saturday 12-5pm, Sunday 11am-5pm. $10 admission. More info. Live music, craft beer, local food, kids activities. Friday 5-10pm, Saturday 12-10pm. More info. Traditional Oktoberfest beer, Bavarian fare, live Oompah music. Entertainment including raffles, music, vendors, German food & beer. $10 admission adults/kids free. Live authentic German Oompah music from The Happy Wanderers and Jimmy's Bavarians. 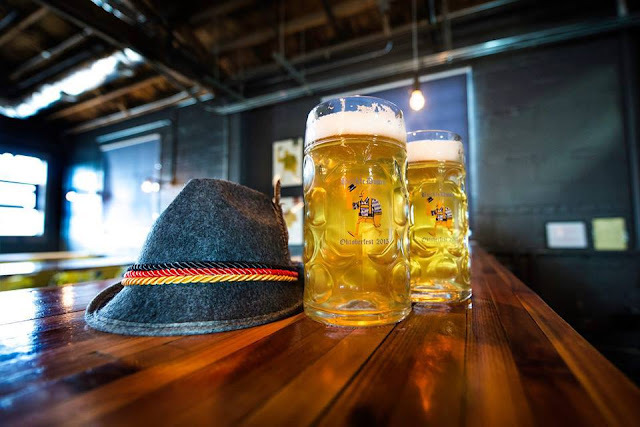 Enjoy a beer stein full of Atom Smasher: Oak Aged Oktoberfest Style Lager, while eating authentic German food and playing classic Oktoberfest games! 52nd annual festival with German food and beer. Bier barrel race, running of the wieners, yodeling contest and barmaid stein race. Menu options include potato pancakes, bratwurst, schnitzel, sauerkraut and more. Advance two-day entry tickets are $14. Gate tickets are $10 per day. VIP party tickets available. Friday 5pm-12am, Saturday 12pm-12am. More info. Rauchbier & other special beer releases, outdoor biergarten, food trucks throughout the day, live music and more. Biergarten serving "Das Boot" Oaktoberfest Bier, "Kaiser Kolsch" & many more favorites. Featuring 80 unique craft beers, including one of the largest selections of Oktoberfest beers in the area. Live music, local food. Tickets $45-55. More info. Live music, German beer & food, family activities. Friday 5-10pm, Saturday 12-10pm. Tickets $12 adults/$8 children. More info. Ceremonial keg tapping, live music, polka lessons, beer stein contest, kids entertainment. Tickets $5 adults. More info. Featuring authentic German food, music, entertainment and of course beer! Family activities all day Saturday and official Sam Adams stein hoisting contest Friday and Saturday nights. Friday 5-10pm, Saturday 11am-10pm. More info. Chicago’s own Goose Island Brewing Co. is bringing Migration Week, a week-long celebration of beer, food and music, to Logan Square September 26-30 to show some local neighborhood love. The week kicks-off with a return of the famous Brewers Workout —an exercise class designed around the day to day life of a brewer. More events are included below with descriptions and links for tickets. Event Description: Kick off your week with a Brewers workout brought to you by Goose Island! Ever wonder how brewers get those svelte figures? We are hosting an exercise class designed around the day to day life of a brewer. After the class we will celebrate with the end product that those brewers work so hard to make. Post-workout beers at 8 p.m. at The Rocking Horse 2535 N. Milwaukee Ave., Chicago, IL 60647). Event Description: Celebrate Logan Square Migration week at a local favorite: Bang Bang Pie Shop. Treat yourself to pies inspired by and created with a variety of Goose Island beers. Event Description: Explore the effects on aging beer using five different vintages (2010-2014) of Matilda from Goose Island accompanied by a tasting menu from Longman and Eagle. This is a rare offering as the older vintages are no longer available for purchase. Event Description: 1516, Goose Island’s fall Fulton & Wood release, is brewed to honor the traditional German brewing practices and processes as a gently smoked Bavarian Kellerbier— slightly hazy with bready malt and a clean finish. Well balanced and complex, the beer drinks well alone or with food. The name 1516 pays homage to the 500th anniversary of the Reinheitsgebot or German Beer Purity Law. This law stated that the only ingredients that could be used in production of beer were water, barley and hops. It was adopted by all of Bavaria on April 23, 1516, making this year the 500th anniversary. Please join the 1516 team and the rest of Goose Island at the Radler for a celebration of this limited release. Time: 6:30 p.m. doors open; ends at 10 p.m.